Explore all Waterproof Phone Cases made by Skinit. Capture all of your water adventures and keep any Apple iPhone or Samsung Galaxy phone safe and dry. 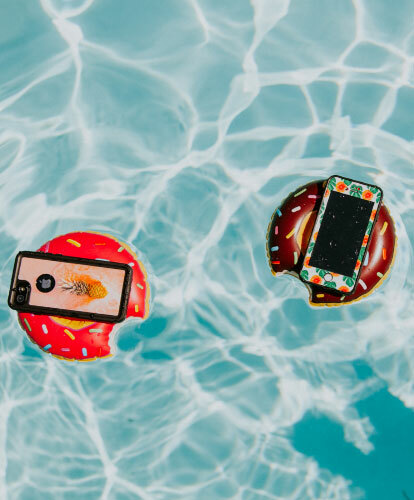 From pool parties, beach trips to jumping in the lake, the new Waterproof Phone Cases by Skinit are built for any water adventure. Don't just resist water, proof yourself. Pick your Apple iPhone model below and browse all available Waterproof Phone Cases. Never hesitate jumping in. Each Skinit Samsung Waterproof Phone Case is water-tight so you can stay out longer and go deeper this season. Explore all Waterproof Phone Cases for Samsung Galaxy. Don't miss a snap and miss out on any memories. Each Waterproof Case is designed for full camera functionality, front + rear-facing. So you can keep your selfie game strong all season. We removed the hassle. Each Case is engineered for easy accessibility to any input or charger port when you need it and a sealed port protection when you don't. Waterproof, sweat-proof & dirt-proof. No matter where the adventure takes you, keep your phone protected from all of the elements.